Have you ever wanted to know how early man and prehistoric people made their survival tools? Have you ever wanted to learn about flintknapping? Take part in a flintknapping workshop/course or see a demonstration? Then you are in the right place. 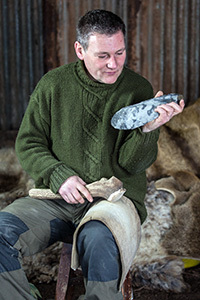 I’m Karl Lee, a master flintknapper and experiential archaeologist with over 20 years experience of teaching the manufacture and use of stone (“lithic”), bone and wooden tools. I have an online shop where you can buy my British hand made replicas. These include flint, antler, bone and wood tools all crafted using prehistoric techniques. Please feel free to get in touch with any comments or questions using the form on my contact page, as any feedback is much appreciated.